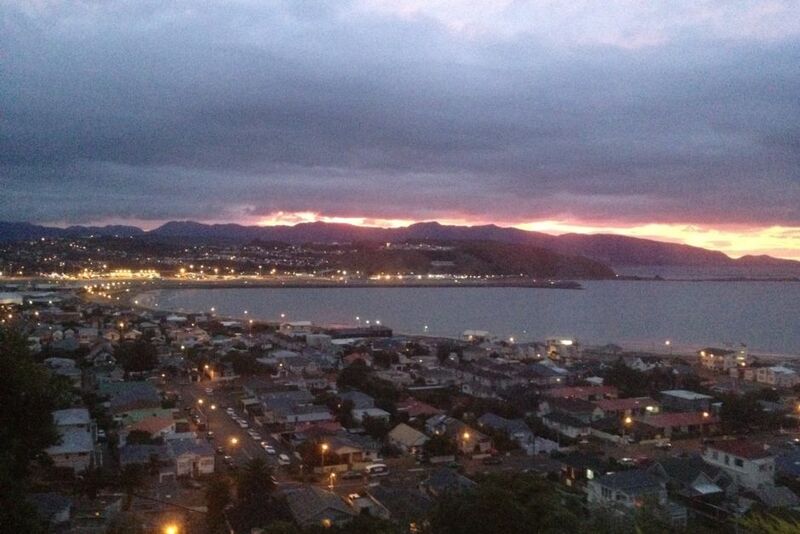 Wake up to sound of waves on Lyall Bay beach with breath taking views. Watch the surf from bed or the lounge. This cosy home is just a 15 minute walk over the hill to the Wellington Zoo and Newtown Park. Experience the beautiful Wellington Southern Walkway up Mt Albert and along to Mt Victoria lookout. Enjoy the local cafes and surf. Melrose has so much to offer and this location just 5 mins to the airport and Weta Cave. Shower over bath. Kitchen is retro 70s chic and has everything you need incl dishwasher and breville coffee. The TV has access to Netflix. Bring your own HDMI cable and laptop/ipad if you want to watch TV on Demand. Taxi to Courtenay Pl for about $25. Sleeping up to 8 this home suits couples, business travellers, families and groups. Please note this is a quiet neighbourhood and there is a flat below. Portacot is available for your little ones, just bring your child's bedding, and children under 2 are free. This house is located in a quiet neighbourhood and is sheltered from the predominant NW wind. Parking is available on the street. The house is up two flights of steps - which is typical of Wellington homes with stunning views! Built in 1937, the backyard is made of up steep rambling pathways and is not recommended for unattended children. No smoking inside the house, but you are welcome to smoke outside. This is a residential area, and there is a separate flat downstairs. Please refrain from playing the stereo too loud and no parties. Please leave the house as you found it and remove any rubbish. Linen is supplied. Failure to do so may result in further cleaning charges. Please note if you have mobility issues that this house might an issue as it is up a flight of steps. If you wish to watch network TV, you may want to bring an HDMI cable and your laptop or iPad to connect to the TV. It is up to parents to ensure that young children are not left in the back section unattended. Extras: Linen (included). NOTE: Under Kiwi bach tradition you are expected to clean the house and do the dishes before you leave. Hi, I'm Kate! I enjoy wine, food, movies and music. I play a tenor ukulele but not very well! Our home is has a separate upstairs and smaller downstairs unit. We share the two spaces depending on bookings and when our family need the space. After moving back from the Wairarapa, I feel in love with the sea views from this house. Our home is has a separate upstairs and smaller downstairs unit. We share the two spaces depending on bookings and when our family need the space. Wellington has a lot to offer including some great running, walking and cycling tracks, as well as some great dining and drinking spots. There are also some wonderful family activities available in the region. Close to airport, city and Weta Cave. Walk to iconic Maranui Cafe. Suitable for families, couples and groups. If you're keen to go further a field and venture into the Wairarapa, we can help you out there too. This house is located near the ocean, with amazing views of the coast and the Cook Strait. Cycle, walk, run or drive around the coast. Go seal spotting and catch some great photos at Red Rocks. Watch the ferries go past and the planes come and go. Gas heating in lounge and electric blankets on beds. Bedding, blankets and towels provided. Wifi details available on site. Living room with Futon couch, and retro lounge suite. Breville coffee machine that takes espresso grind coffee. Complete dinner set and utensils provided. Large dining table with views out over the ocean. 42" Sony TV with Google Chorecast and HDMI cable. Netflix available. The Lookout has all the comforts of a house by the beach. The beds were comfortable and the communal areas spacious enough for 6 of us. The views over the beach are stunning. We even saw a pod of over 30 dolphins swim around the bay - take binoculars! Great property to stay for the holidays. We were there in the middle of winter but lovely and warm with the heaters on. Typical NZ house with condensation in winter but windows are easily vented. Good location with amazing view. Not suitable if mobility is an issue though as up some steps on a narrow road. Would recommend and stay there again if in Wellington. Loved our stay here! Warm and cozy with an excellent view over the harbour. An easy trip into the city but we loved exploring the Lyall Bay area. Weta Workshop is in nearby Mirarmar.